Bite into some fun at the Julian Apple Days Festival this weekend at the Menghini Winery. This autumn festival features apple-related fun for the whole family. 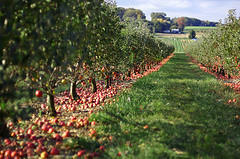 Try different varieties of apples, enjoy an antique tractor display, or participate in a gold panning demonstration. Hungry festival attendees will flip for the seventh annual apple pie competition, featuring flavors ranging from classic apple to apple-peach or apple-berry. Baking enthusiasts can enter their apple-flavored creations in the competition for the chance to win a $300 grand prize. On Saturday, the festival will crown a Mr. and Mrs. Apple Days. Admission to the festival is $5. Children under 12 are free, and the first 250 people through the gate will receive a free pie server. Last year’s festival attracted more than 3,000 guests, so this year’s festival is guaranteed to be a good time! We'll see you there, Naval Complex San Diego residents!